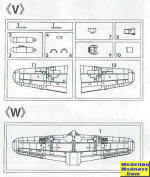 The Go Ni Gata (Model or Type Five Two) was the fifth major airframe design in the Type Zero Shipboard Fighter series. It was powered by the second engine type assigned, hence the name Five Two. Deliveries of the plain (not kou, otsu or hei (a, b, c)) Five Two began in August 1943, first from Mitsubishi. In November of that year, Nakajima also began delivering it. Mitsubishi made 747 of the plain 52, but it is the Nakajima-built version, with its underside camouflage rising to the horizontal stabilizer, that tends to be shown on kit boxes. The Five Two served aboard several Japanese aircraft carriers. The last 52 variant to serve on a carrier is thought to be the 52 otsu. Over two dozen land-based naval air units received 52s of one variant or another. Superseding the Hasegawa kit of the early 1970s, an entirely new tooling, kit AP 22, went on sale in Japan in June 1994. A build review of it appears at http://modelingmadness.com/scott/axis/j/zeros.htm . Later, the kit was part of two-in-one boxings, starting with a P-51D (“Commemorative Flight 1995” SP153, 51653), and in 2012 with a Model 21 Zero Fighter (“Super Ace Combo”, planes flown by Tetsuzō Iwamoto, 02009). It was reissued as a singleton (D22, 00452) and as a special edition (“Super Ace”, Tetsuzō Iwamoto again, 00919). A reissue that was apparently not exported to the USA had most of the parts pre-painted (LP 101, 61561-8). Another featured a pre-painted canopy frame (SS16). A box art boo-boo affects the August 2000 special edition “302nd Flying Group” (00094). Its box art depicts a 52 kou and is identical to the Shigeo Koike painting on the 1/48 release, JT70. 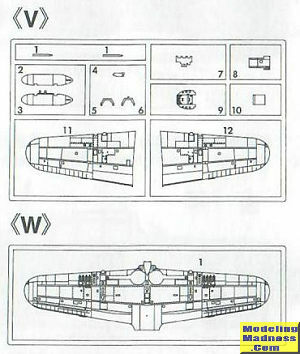 Still, 00094 does not include any wing pieces to depict the 52 kou (52a). The parts build a plain 52. A similar packaging error affects “Fighter Bomber” (02019), which was released in 2013. The box art is a 52 kou but no other part of the box indicates “kou” or “a”, and the parts build a plain 52, not a 52 kou. That one contains a bomb and bomb rack in pot metal and decals with nearly 80 numerals in white and yellow. Until Tamiya’s 2012 release of a plain Five Two in 1/72 scale, AP 22 and its reissues were the finest examples in 1/72 scale. This kit has the eleven small exhaust stacks and does not represent the early-production 52, which is thought to have had only two. Hasegawa got the shapes and dimensions right with only a few exceptions: The control surfaces have bumps on them to suggest framework; the wheel wells are too shallow to accept the main wheels; there are sink marks near the wing roots and in some of the wing pieces; the cockpit opening should have rounded corners near the seat back. The cockpit sides lack any sort of detailing and there is no pilot. The engine is adequate, but the prop spinner has a backing disk that leaves a visible seam. Each prop blade is installed separately. The cowl flaps are positioned for cruising, being neither fully open nor fully closed. Fit is generally excellent, but the piece for the fuselage guns requires care, and the joint on the underside, where the aft edge of the wing lower half attaches to the fuselage, is not sturdy. It can be improved by building a ledge using sheet styrene. The inboard landing gear doors have little to rest on and are fussy to attach. The one-piece canopy is a gem, and as Model Art noted, its windscreen fits the forward fuselage better than on the Model 21 Zero kit in this series. 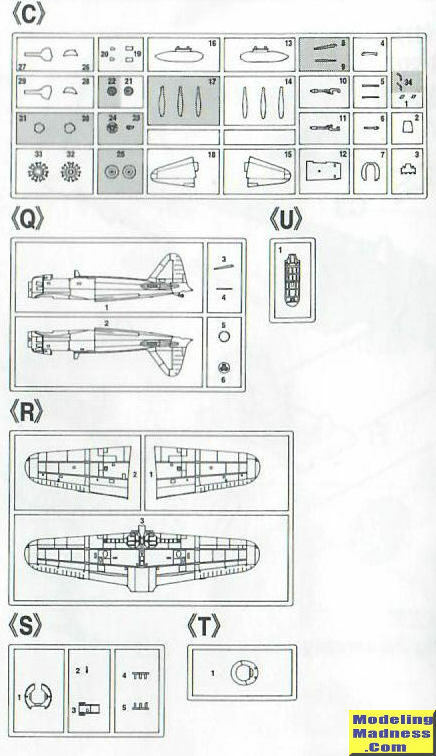 The instructions are easy enough but they don’t mention the difference in painting schemes between the Mitsubishi- and Nakajima-built planes. There is also an issue about which spinner to choose. Spinner Q5 is larger than the two spinners on sprue C, and the instructions call for Q5 to be used. However, some Japanese references state that the largest spinner was not adopted until sometime during otsu production, so you may want to sample the look of spinner C31, which I believe looks more accurate for the plain 52 and 52 kou. The decals are for Nos. 253 Kū (ace Tetsuzō Iwamoto again), the ill-fated 261 Kū, and 263 Kū. All of the white decal ink has yellowed over the years. For two of the schemes, some hinomaru have to be applied in two layers. The 52 kou (also koh or kō) is best distinguished from the plain 52 by the fairing at the wing leading edge for each of the wing cannon. The new belt-fed Type 99 2 gou 4 gata wing cannon required the relocation of the cartridge case ejection port. The bulges on the underside of the wing were moved, also, and reduced in size. The kou was delivered February-June 1944. Comments conflict about whether Nakajima made any, so it would be safer to use the Mitsubishi color scheme for this one…. if Hasegawa had actually made the kou in 1/72 scale. 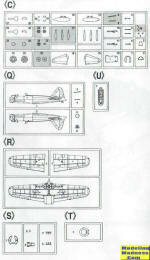 As mentioned above, special editions “302nd Flying Group” and “Fighter Bomber” incorrectly depict a kou in the box art, while wing parts depict a plain 52. The 52 otsu (A6M5b) was delivered June-October 1944, and both Mitsubishi and Nakajima manufactured it. The distinguishing features are the first armored glass windscreen for a Zero; two different calibers of guns in the fuselage (13.2 mm cal. on the right, 7.7 mm on the left) with corresponding revision of the cowling; the gas ports near the windscreen (for the fuselage guns) were angled downward; the revised drop tank dangled from a single pylon. The box lid of 00272 claims that the model is an otsu, but it is not. This 2001 release did not supply an armored windscreen, fuselage halves with correct gas ports, or the dangling belly tank. It supplies the wing lower half for a plain 52 and the wing upper halves for a 52 hei, which would create a non-existent hybrid. The 52 hei (A6M5c) was considerably heavier than the plain 52. Deliveries spanned October 1944-March 1945. Nakajima built the majority. Because of its reduced performance, the hei tended to be used for B-29 interception and special (suicide) attack. It is distinguished from the otsu by its four protruding wing guns; brackets for small air-to-air rockets under the wings; and many revised wing panels. A new type of drop tank was often fitted. The left fuselage gun of the otsu was removed and the gas port was deleted. In some cases, the hole in the cowl was faired over, also. The hei apparently introduced seat armor and a two-level seat. There was armored glass behind the pilot’s head but it was often removed. Not waiting for Hasegawa to make a hei, Gartex released GA:11 (69011-0) in 1994. It contains a one-piece resin wing for a hei and a Hasegawa kit of the plain Five Two, plus two wing guns and four rockets in metal. In May 2001, Hasegawa released its first hei in 1/72 as kit D23 (00453-5); in 2002, “303rd Fighter Squadron” (00289); in 2003, “Jinrai Squadron” (00628); in 2012, as part of “Samurai Combo” (01973); and in the same year, as part of “352nd Flying Group” (01989). Hasegawa’s hei provides wings that are close to the technical drawing in Aero Detail 7, including brackets for air-to-air rockets, but not the rockets themselves. The revised wing panels are depicted. There is a good rendering of the belly tank. The four wing guns are there, but too big around. The two-level seat is provided, and so is the armored glass above the seat. There is a gas port on the left side of the forward fuselage where there should not be one. Still missing are the armored glass at the windscreen and the downward-slanting gas port near the windscreen on the right. The Five Two doesn’t seem to be as popular with modelers as the Two One. Not used for the “Japanese blitzkrieg” of 1941-42, the Five Two variants are nevertheless important in terms of numbers built and battles fought. Unfortunately, as of December 1, 2017, Hasegawa still has not made a proper kou or otsu in 1/72 scale. Their plain 52 is not as good as Tamiya’s, but is quite respectable. Their hei is generally better than Academy’s. They are the only firm to offer both a plain 52 and a 52 hei in this scale. Aero Detail 7, Dai Nippon Kaiga Co., Ltd., 1993. Model Art No. 518, July 1998. Sekai no Kessaku Ki (Famous Airplanes of the World) No. 9, Bunrindou, 1988, 1993 reprint.